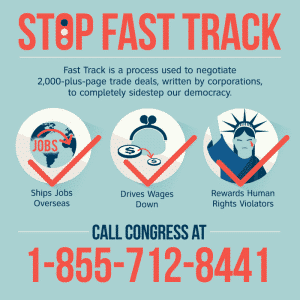 APWU: Tell Your Senators to Stop ‘Fast Tracking’ a Bad Trade Deal – Call Before Tuesday! Web News Article #: 129-201506/19/2015 – Like the Zombie apocalypse, legislation that would “fast track” a bad trade deal has risen from the dead. Workers, environmentalists and other progressives thwarted passage of the package on June 12, when the House voted against a companion bill that was essential to passage of the trade deal. But the fight isn’t over. On June 18, the House voted to approve fast-track authority separately, giving the president the power to negotiate the corporate-backed Trans-Pacific Partnership (TPP) – in secret – and without permitting members of Congress to offer any amendments. The Senate is poised to vote on the House version of the bill on Tuesday. 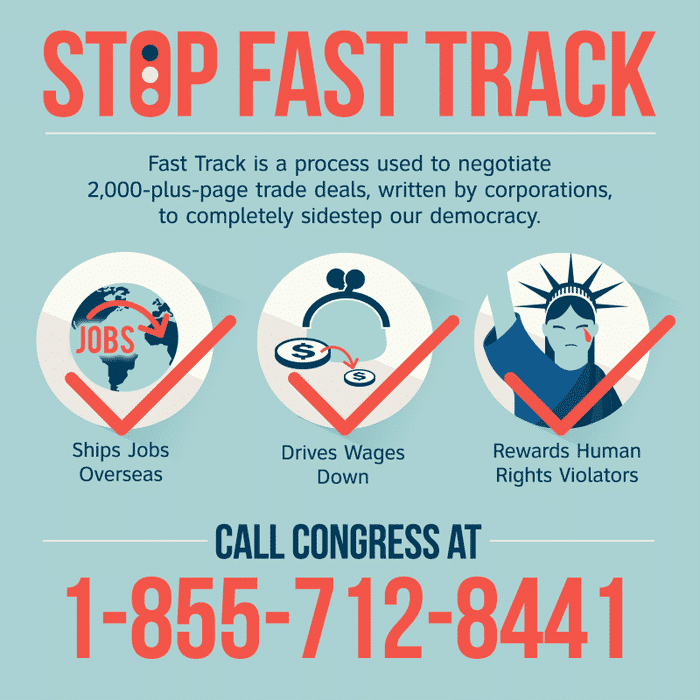 Call 1-855-712-8441 and ask your senators to say NO to Fast Track and the TPP. TPP regulations would trump the laws of participating countries. That means, for example, that the TPP would erode our food-safety standards by allowing U.S. and foreign corporations to initiate proceedings against the U.S. government if our food safety regulations limit the rights granted to investors under the agreement. The TPP and other proposed trade agreements covered by fast-track authority also include rules that could promote privatization and/or dramatically affect the viability of the U.S. Postal Service. Click here to learn more about Fast Track. This entry was posted in General Union Business, Postal Reform and Politics and tagged Bad Trade Deal, corporate-backed Trans-Pacific Partnership, Fast Tracking, postal legislation, postal reform, Stop Fast Track, TTP. Bookmark the permalink.